Single-leaf woodcut on paper. Watermark: crossed keys. 280 x 198 mm, woodcut 253 x 180 mm. – Woodblock print in dark grey-brown ink. 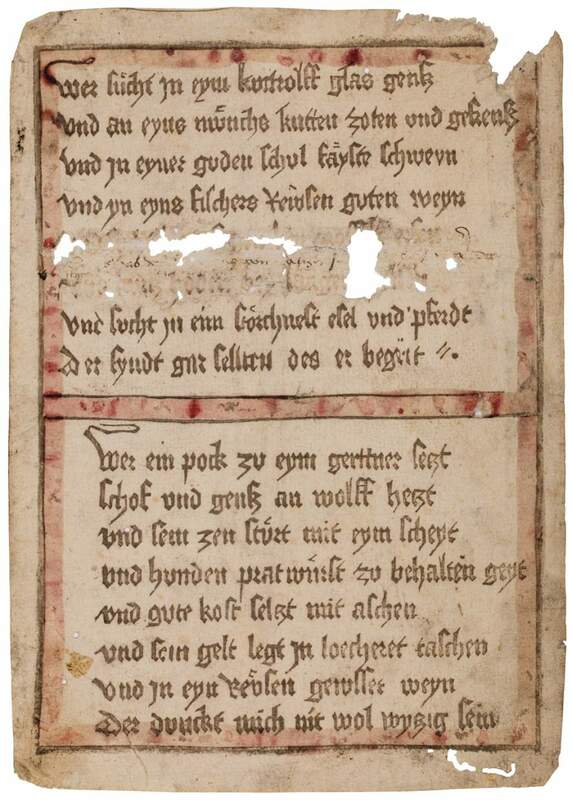 Single-sheet printing with two Priamel: "Wer sucht in einem Guttrolfglas Gänse" and "Wer einen Bock zu einem Gärtner setzt", both attributed to Hans Rosenplüt (c. 1400-1460). The German Priamel is a particular type of gnomic poetry, most popular in Nuremberg in the 15th century. They are short poems consisting of rhymed couplets usually ending in a punchline. These moralising, didactic, witty sayings treat many subjects – both religious and secular, even such pragmatic themes as the household or health – and mostly address human weakness. This is also the case in the two eight-line Priamel of our broadside: 'He who looks for geese in an urine flask...' and 'He who puts a billy goat in charge of the garden...' The first line of the latter poem is still used in proverbial German (Den Bock zum Gärtner machen) as the ultimate case of imprudence. Hans Rosenplüt, called Schnepperer, Nuremberg citizen since 1426, is the first craftsman and poet known to us by name, preceding the famous Nuremberg shoemaker and poet Hans Sachs by almost a century. Single-sheet prints like this, with or without illustration, have been produced in large quantities, but they were usually subjected to considerable wear and tear. Only the sheets preserved in books or pasted onto wooden boards survived the centuries. Thus, all single-leaf prints from the 15th century are extremely rare today.